Design of logistic systems is a final discipline for preparing young engineers from area of logistics to become experts, who are planning and creating new, or improving current logistic systems. For being able to do so, they are using the knowledge from mathematics, statistics, operation analysis, modelling, simulation, system theory and from strategic, production and commercial logistics, of which such a system consists of. A logistic system is a system which controls and enables the realization of “flow” of materials, information and finance. Content of this book consists of two essential parts: Theory of planning and designing and practical applications, projects, and case studies. Logistic objects (as a philosophy of management) are the flows (as substance changing its parameter in time and place). These objects are complex and dynamic systems. If we wish to control them, we need to know them – analyze and model. Due to the fact that a flow is also a chain of depended tasks, elementary processes, its modelling in real production, distribution and service systems with help of analytical mathematical models is very challenging and most of the times impossible. 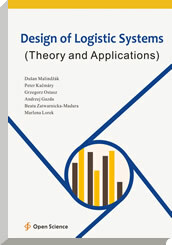 For that reason, also the design of logistic systems is not based on exact or approximate methods just like statistical methods, geometric tasks, simulation, heuristics, etc. It mostly focuses on recommended actions, which differ from case to case depending on the level of creator’s knowledge, amount of information and his/her own creativity; which approach, model or algorithm he/she will use or create. Theoretic part of this book mostly concerns design, system projection, types of model used according to the creator’s creative power, innovation and phases of projection. These phases mostly mean collecting and studying of information about created system, problems and tasks definition, methods for system analysis, approaches for decomposition of systems, methods for creation of new logistic system structure and design of functional algorithm for logistic system synthesis. We apply the synthesis of logistic system at least to two hierarchical levels: macro-logistical - creation of global logistic system, which mostly covers external relations of object, for which the system is created; and micro-logistical models of individual functions and tasks. This part also includes technical site of projection documentation and standardization of projection tasks. Theoretical framework of projection are projection methods, which describe approaches, model approaches, case studies, usability of simulation while projection work, heuristic methods, quantitative approaches and reengineering as a radical change. Experiences in education processes confirmed us, that theory is one thing but its application is another one. Most of the times, study of one created logistic system will give a much better picture about this difficult task then hours of theory. That is the reason why in this book a large space is given to presentation of applications, projects, case studies and models already done for several companies. Reader hopefully will forgive us for not mentioning the real numerical data and detailed steps of innovations in some cases. That way we wanted to preserve the authorization rights of companies and authors as well. We have found out that exactly this type of scientific literature is missing on market, either in Slovakia or in Finland, that’s why we are hoping that it will successfully fill the gap and will become a good and rich study material for students from area of logistics, management and projection of production processes and related areas. Logistics was an evolutionary impulse in the last 10 years of 20th century and will be at least for next 10 – 15 years. Globalization and creation of almost consistent world market, information networks and technologies, production costs, production and consumption volume is not in balance. That is the reason for creation of flows, which are necessary to be designed, controlled, managed, to what this book might contribute by its value. 4.3 Design of Model for Creation of Basic Foil Manufacturing Plan in Chemosvit Fólie a.s.
4.4 Analytic Application of Forecasting of Orders for Printing Rollers in Chemosvit Fólie a.s.
Dušan Malindžák is a professor of the Industrial Logistics and Industrial Process Control in the Institute of Industrial Logistics and Transport at the Technical University of Košiceand Politechnika Rzeszow. He is the specialist for a production logistic systems design, process control and improvements, SCM and heuristics. He uses his experience in many projects with real industrial companies in order to increase their effectiveness which resulted to reducing of costs and increasing their competitiveness. Peter Kačmáry is an assistant of professor Malindžák in the Institute of Industrial Logistics and Transport at the Technical University of Košice. He is also the researcher in the area of industrial logistics focused mainly to raw material sale and demand forecasting. This branch was the subject of his Ph.D. study which he finished in 2011. His theoretical knowledge was extended with the practical skill while he was working several years in the industry area as a production planner and warehouse supervisor. His hobbies are hiking, skiing, cycling and travelling. Gregory Ostasz is dean of the Faculty of Management Rzeszów University of Technology and Head of the Department of Humanities. Research interests include economic history, European integration, economic doctrines. Andrzej Gazda is a professor in the Department of Management Systems and Logistics Rzeszów University of Technology, Faculty of Management. Research interests relate to quality management, logistics and internal audit. Beata Zatwarnicka-Madura is an assistant professor in the Department of Marketing, Faculty of Management Rzeszów University of Technology. Her main research interests include marketing, behavior of buyers, sales techniques. Marlena Lorek is employed as an assistant in the Department of Management Systems and Logistics Rzeszów University of Technology. Research interests include: management, security, logistics and internal audit. Teachers, managers, university students, experts dealing in trade and industries companies. Experiences in education processes confirmed us that theory is one thing but its application is another one. Most of the times, study of one created logistic system will give a much better picture about this difficult task then hours of theory. The theory was created by the solving of a large number of projects, which the authors solved for the specific companies in Slovakia, Poland and Finland.